Anyone who has ever had a baby knows the world becomes a friendly place when you have a baby in tow. Strangers in the grocery store, the post office, or the mall, who would otherwise walk right past as though you didn’t exist, suddenly have the time to stop and chat. They even do a bit of flirting—making silly faces and funny noises—hoping to get a gurgled chuckle or a toothless smile from the little one perched in the shopping cart. I wonder if it wasn’t something like that when Joseph and Mary arrived at the temple to dedicate their baby to God. As the young family entered, two senior citizens waiting inside turned their heads. If they were anything like folks in the canned vegetables aisle, their faces brightened and they moved closer, just to catch a glimpse of the baby the youthful mother was carrying. We really don’t know much about Simeon or Anna. Like those strangers shopping for groceries, their brief encounter with Mary and her baby only lasts a moment. When it’s over, they move on, and we never see them again. But the moment is unforgettable—enough so that when Doctor Luke heard about it much, much later (presumably from Mary), he knew this story had to go in the book he was writing. What seems on the surface as just one of those chance meetings, goes down in history as one of the most important events in Simeon and Anna’s long lives, and was certainly one Jesus’ mother never forgot (Luke 2:22-39). After living for so many years, both Simeon and Anna had seen a lot of life and had drunk deeply of this world’s sorrows. Luke gives us more demographics on Anna, so we know she was once married, heading down the expected path for young women, imagining herself as the mother with the baby everyone wants to see. Instead, seven agonizing years passed without a successful pregnancy. She was, by all accounts a disaster as a wife, for her job as a woman was to produce sons for her husband. Anna didn’t even produce daughters. On top of the heartache that surely took up residence in her soul, Anna’s husband died. If she married in her early teens (which is almost certain), she entered widowhood in her early twenties. It was the worst possible outcome for any woman and one that relegated her to live out her days in the margins of a society that had little use for her. In a culture that identified a woman by her husband and her sons, Anna reverted back to going under her father’s name. Luke introduces her as “the daughter of Phanuel, of the tribe of Asher.” We don’t know her husband’s name. It’s as though she never had a husband. It may also indicate that after her husband’s death her in-laws threw her out—a common fate for widows in third world cultures. And since Anna’s barrenness was common knowledge, she was crossed off as a potential candidate for remarriage in any matchmaker’s book. How many hundreds of times did Anna bump into young mothers with their babies over the years and feel a stab of sorrow in her heart? Today in the temple that old pang was gone. The sight of this mother and child caused her spirits to soar. We don’t have any details of Simeon’s story. Like the generation among us that still remembers the horrors of WWII, he and Anna were old enough to recall stories of the days when the invading Romans conquered Jerusalem and their lives were changed forever. Since their late teens or early twenties, they had lived under Roman occupation. Gentiles were in power, and the Jews were an oppressed people. Such sorrows are foreign to most of us, but they weighed heavily on their hearts. Both were waiting… had waited for decades for the moment before them now. Anna and Simeon didn’t decorate trees, send out cards or shop for presents in anticipation of Christmas. They fasted and prayed. Both were prophets, and God revealed to them that this was the child they had waited for all their lives. They understood that their private hopes and the hopes of the world were answered in the baby cradled in his mother’s arms. The troubles that occupy our hearts—that we try to put out just for a day or two to enjoy (or endure) the festivities of Christmas—are the reasons Jesus came. The hurt in Anna’s heart, the shattered dreams, the endless lonely years she spent on the fringes of society are reasons Jesus came. The reign of fear in today’s world, the hunger, pain and suffering we see on faces around us and in the evening news, the abuse of power, the rise of tyrants, and rampant injustice are reasons Jesus came. All of the troubles that make Christmas so hard for so many are reasons Jesus came. In the grocery story, a little baby has the power to bring a smile to a total stranger’s face and just maybe give a lift to a heavy heart. But the baby in the temple brought far more than a smile. He brought help. The baby Jesus was on a rescue mission, reconnecting this broken world with the God who created it, giving us a reason—not just for the season—but for living and hoping and staying in there when the going gets rough. When Simeon reached out and took the infant Jesus in his arms, he was embracing hope. Simeon didn’t live to see how it all turned out. He already knew it wasn’t going to be easy. 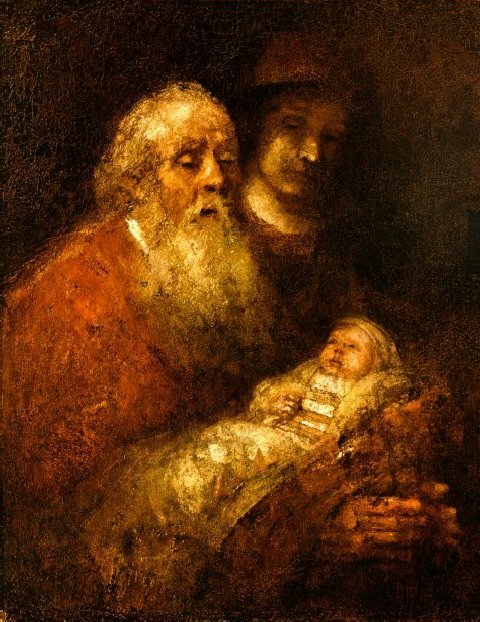 But even knowing more sorrow lay ahead, even for the baby’s dear mother, Simeon died in peace knowing the darkness was defeated—a light had broken through—for Israel, for the Romans, and also for us. And the widow Anna, a woman of sorrows, makes her final appearance in a burst of joy. She may have been disqualified from a woman’s role in her culture, but God gave her a staring role in his story. God placed the woman, who never got to welcome a baby of her own, first in line to welcome this one. She is the first evangelist, the first to proclaim the Good News that Jesus is the promised King who has come to deliver us. Her message is one we all need to hear. Maybe this Christmas we’ll all stop, if only for a moment, to come and behold the baby, to share the peace of Simeon and enter the joy of Anna. Come, let us celebrate the light that has broken through our darkness.